Sip on this refreshing ice tea to beat the heat this summer. This thirst-quencher features a South African classic - Rooibos tea - and is the perfect way to cool down around the braai or lunch table. 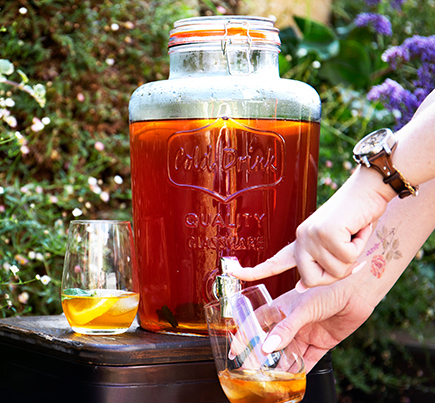 Make and serve it in our 7.5l Beverage Dispenser (available at The Consol Shops in Woodmead, Gauteng, Cornubia, KwaZulu-Natal, and Stellenbosch, Western Cape) for a delicious drink on tap next time you’re entertaining. Boil the water and pour into the Consol Beverage Dispenser. Add the tea bags of your choice and leave for 15 minutes. Remove the tea bags and add the other ingredients (press the mint leaves between your hands first to help release their flavour). Stir, and then allow the tea to cool to room temperature. Add ice before serving.